March 17, 2011 by Aaron Kr. There are a lot of people with incredible sneaker collections around the world… and then there’s the ShoeZeum! Many of us consider ourselves to be serious collectors, but after a look at what you’re about to see, you may face the harsh reality of learning what amateurs most of us actually are in comparison to the sheer awesomeness of one devoted sneakerhead’s jaw-dropping Nike arsenal. Jordan Michael Geller (seriously his name! 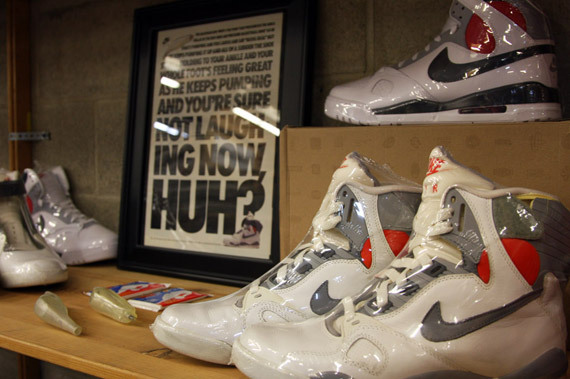 ), creator of the ShoeZeum, may quite possibly possess the most thorough Nike collection on earth. You may remember seeing some of Jordan’s auctions on eBay a few months back, and after a look at what turned out to be just the tip of the iceberg, we had to see more for ourselves, so Team Sneaker News packed up and headed cross-country to San Diego to explore the wonders of the ShoeZeum for ourselves. Words and photos can do no justice to any visitor’s first impression of the ShoeZeum when initially entering the 2-floor 9,000 square foot warehouse. When you love sneakers like we do, there is no more overwhelming feeling than trying to figure out where to start when you’re smack in the middle of a 2,000 pair sneaker collection. Our initial tour of the premises took roughly three hours before we had made our way through every shoe, and that was just a quick walk through. The collection covers nearly every aspect and category of Nike sneakers over the entire span of the Swoosh’s almost 40 year history. There are a lot of impressive collections out there, but you’d be very hard pressed to find one anywhere that covers such a comprehensive cross section of Nike footwear. If the ShoeZeum was simply a spread out showcase of Jordan’s amazing sneaker collection, it would be eye-poppingly awesome right there, but this dedicated young man has really gone all out to ensure that his creation was far more than that. Every shelf, sneaker and display in the Shoezeum has been accompanied by corresponding props, memorabilia and decorative effects to really capture that museum feel and help tell the stories behind the shoes and sectional themes. When discussing the madness involved in putting all this together, Jordan proudly compares himself to Willy Wonka and takes unabashed pride in his eccentricity and blind passion for Nike sneakers. While he’s aware that some people may think he’s crazy for having done this, it doesn’t phase him for a second. He’s living every kid’s dream – to go out and get your hands on every toy you’ve ever wanted – and who can’t relate to that? And this is far from a silver spoon story where Daddy’s credit card picked up the tab for all these goodies. 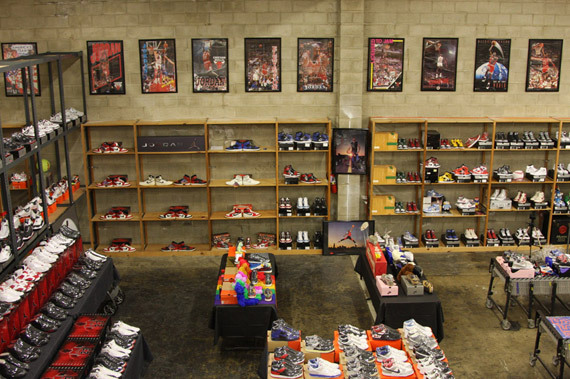 Everything you see here started more than ten years ago with $300 worth of swap meet Nikes and a few eBay listings that paved the way for a multi-million dollar eBay sneaker store and the warehouse that is now home to the ShoeZeum. Jordan has put his heart and soul into sneakers in life and business and his ShoeZeum now stands as a triumphant retrospective, to not only the history of Nike sneakers, but the story of his own life and the business that became the foundation of this astonishing collection. Best believe that there has been extreme attention to detail paid to every facet of this marvel, right down to what just might be the most miraculous ShoeZeum claim of them all. With the exception of less than 1% of the 2,000 sneakers, every pair in the collection is deadstock and in Jordan’s size (11-12), a firm set of criteria that, as you can imagine, made amassing such a meticulous stockpile a very painstaking process. The time, discipline, funds, knowledge and love that Jordan has poured into the ShoeZeum are a testament to collectors everywhere, as the ShoeZeum is not just perhaps the most impressive sneaker collection on earth, but just might be one of the best collections of anything! Check out an interview with Jordan after the jump and head over to Sneaker News HD for the full ‘Sneaker News Goes Inside the ShoeZeum’ Part 1 gallery. What you’ll see there will give you a good indication of just what’s in store as we bring you an in-depth look around the ShoeZeum over the next few weeks. Huge thanks to Jordan Geller for his hospitality and eagerness to share his creation with the world! 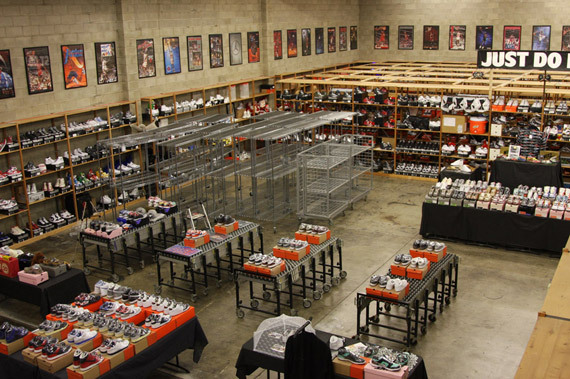 Sneaker News: When did your love for sneakers start and at what point did it begin to expand into a collection that required a warehouse to store? 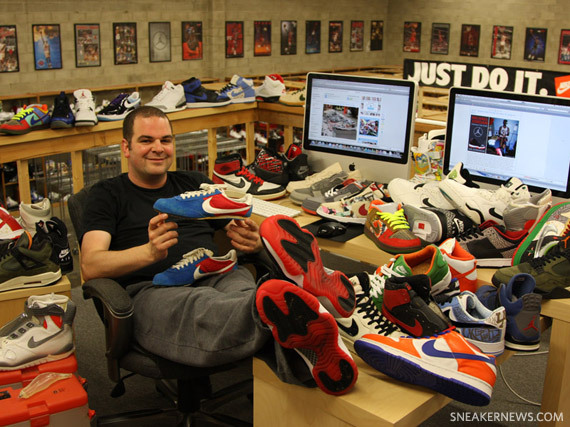 Jordan Geller: I’ve loved Nike sneakers for as long as I can remember. That could have something to do with the fact that my name is Jordan Michael! My love of Nikes can also be traced to my father. When I was a child, my dad ran ten marathons in Nike Waffles and Air Maxes. I used to go to sneaker shops with him every weekend to see and buy the latest and greatest Nike runners. I was drawn to Nikes because of their style, innovation, and the fact that each year the shoes got better. I have been selling shoes on eBay for more than ten years. Over the past three years, my business has been located in a 9000 square foot warehouse in San Diego. About one year ago, I decided to convert my shoe selling operation into the ShoeZeum. I thought that this would be the best way to share my love and passion for Nikes with the world. My vision was simple: Nike x Disneyland x Willy Wonka’s Chocolate Factory = The ShoeZeum. 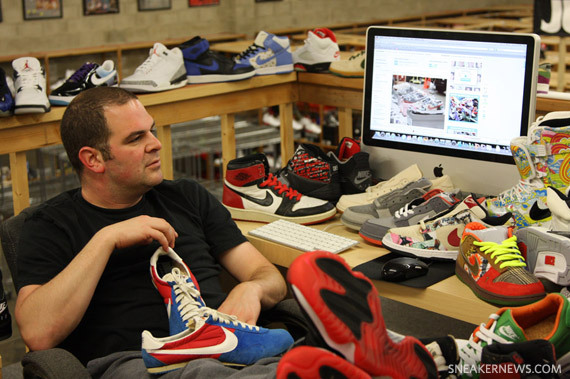 SN: For those who aren’t aware of your impressive history as an eBay seller, please fill our readers in on how your ebay business started and eventually paved the way for the ShoeZeum. JG: I built my eBay business from the ground up starting with just $300. After college, I moved out to San Diego where I went to law school and business school to get my JD/MBA. While in my second year of law school, I ran into a vendor at a local swap meet who had a truck full of Huaraches and Air Forces. I bought the twenty pairs for $15 each and sold them on eBay for $75-$100 per pair. Week after week, I went back to the swap meet and bought as many shoes as I could afford. Eventually the vendor disappeared and I was forced to find Nikes elsewhere. I scoured malls, outlet stores, clearance stores, and online sellers in search of Nikes that I could sell for a profit. Believe it or not, I got enough products in this way to sell more than $10 million dollars worth of Nikes between 2001 and 2010. Building a successful business from the ground up around a product that I love was a dream come true for me. 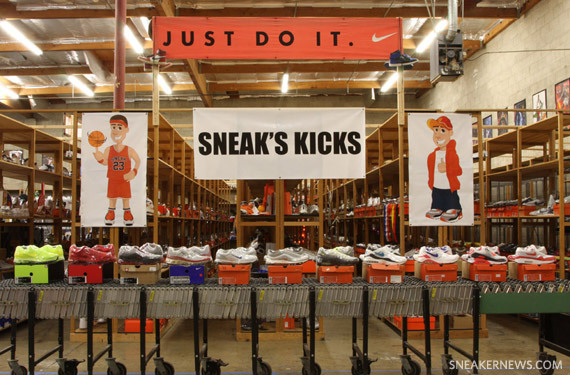 I loved everything about Sneak’s Kicks, but the main thing that I loved was being surrounded by Nikes! Even though I worked nearly 100 hours per week for ten years, Sneak’s Kicks has been the best time of my life so far (building the ShoeZeum is a close second). SN: When you posted some images of the ShoeZeum set up as eBay listings, a lot of people were turned off to the high prices of the auctions. 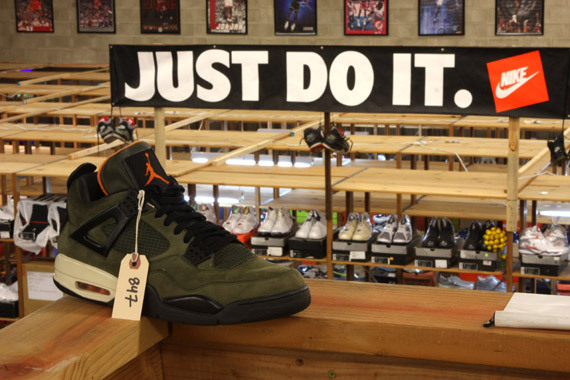 Did you ever have any intention on actually selling the shoes, or was the idea just to showcase your collection in a place where you knew it would be seen? JG: When the ShoeZeum exhibits were listed on eBay, I didn’t intend on selling them (even though one of the exhibits actually did sell to a buyer in the United Kingdom). My idea was simply to use eBay to showcase the collection. I used eBay for four reasons. First, eBay has a ton of traffic and it costs just 5 cents per month to keep a buy it now listing active. I knew I could get a lot of exposure without having to pay very much money for it (ebay item 300504874162 was viewed by more than 24,000 people between December 14th and February 2nd and the listing cost me just ten cents to post). Second, I made all of my money by selling Nike shoes on eBay, so I thought that eBay would be the appropriate place to showcase the collection. Third, many of the shoes themselves came from other eBay sellers from all around the world. Finally, I decided to use eBay because there are tons of eBayers that love Nikes, but nobody was marketing directly to them. I wanted to use my collection and eBay to spread Nike love and passion directly to this audience. SN: How many total pairs of sneakers are in the ShoeZeum? JG: Approximately 2,000 Pairs. Here is a rough breakdown: 500 Jordans, 500 Runners, 300 Basketball, 200 SB, 200 Non-SB Dunks, 200 AF1, and 100 Cross Training/Tennis/ACG/Innovation. SN: In addition to just showcasing your collection, you really went the extra mile by adding all the props and decorative touches to all the displays. Where did all that stuff come from and how hard was it to track down and accumulate all the corresponding components for each exhibit? JG: All of the toys and props in the ShoeZeum came from the same swap meet where my business got started. For nearly 6 months, I spent every weekend rummaging through crap at the swap meet in search of toys and props that would bring my collection to life. Since I grew up shopping at swap meets with my dad, furnishing the ShoeZeum was almost as fun as buying the shoes themselves. Most of the toys were bought to go with shoes that I already owned, but a handful of props were so cool that I actually bought them first and then purchased the corresponding shoes afterwards. In all, I spent less than $1 per pair on toys and props. SN: The fact that you’ve put this collection together is impressive enough, but it’s even more remarkable considering that almost the entire ShoeZeum is made up of deadstock shoes in your size. 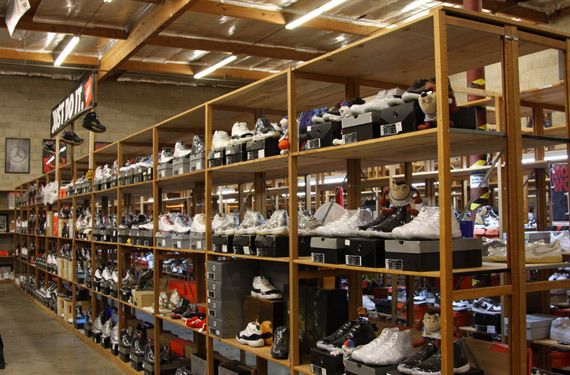 How many total shoes in the ShoeZeum are not deadstock and how many are not in your size? JG: All of the shoes in the ShoeZeum are in my size (between size 11 and 12) with the exception of just one pair (DJ AM’s Eminem Jordan IVs are a size 13). All but ten pairs in the entire collection are deadstock, in their original boxes. SN: Wow! If you find something super-rare that you’ve been looking all over for, but it’s not in your size, do you ever consider making an exception just to have the shoe in your collection? JG: I am only interested in buying shoes in my size. I feel like it would not really be a personal collection if the sizes of the shoes were all over the place. SN: What shoe in the collection was the hardest to get your hands on? JG: My Nike Pump collection was very tough to put together, Two pairs of Air Pressures, three pairs of Command Forces, and one pair of Air Force 180s. Each of these 6 pairs were equally difficult to obtain. My OG Jordan 1 collection was also very tough to put together. It consists of 11 pairs from 1985 (4 white black red, 2 Bred, 1 Metallic Black Sample, 1 Black Toe, 1 White Grey, 1 Black Royal, and 1 AJKO). SN: What was the most you ever paid for a pair of sneakers? JG: $3,383 for the Pre Montreal. I bought them from somebody who found them in an abandoned storage locker in New Mexico. They come with their original box, track spikes, and wrench. This auction ended on a Sunday Evening at 6 pm. As I prepared to place my bid, I spent the entire day on YouTube watching clips of Steve Prefontaine Running. I was so pumped when the auction was ending and soooo excited when I won the shoes. They are my favorite pair of shoes in the ShoeZeum and my most prized possession. They are truly a piece of Nike history and I will never part with them. SN: Rarity and market value aside, what are some of your all time favorite sneakers? JG: My all time favorite shoe is the Silver and Red Air Max 97. I remember when they first came out, I thought they were the most beautiful and innovative shoes in the world. Maybe it’s the metallic 3M upper, or maybe the full air bubble, but whatever the reason is, I absolutely love those shoes. I also love the Air 180 Ultramarine, which was the shoe that my dad ran his fastest marathon in. SN: What are the top three shoes you’d like to add to your collection? SN: With the ShoeZeum ending its run soon, where would you like to take your collection and love of Nike sneakers next? JG: There are so many possibilities! Ultimately, I would love to work for Nike. As for the collection, I think that it would be cool if the ShoeZeum could travel all around the world to share Nike love and passion with sneaker lovers everywhere. I also think that a documentary would be incredible since I built my eBay business and the ShoeZeum from the ground up, with just $300. I have more than 400 hours of video footage of every facet of Sneak’s Kicks and the ShoeZeum. I am very proud of the footage, the business that I created, and the ShoeZeum. SN: Thanks Jordan and best of luck with everything!